A programmer grabbed some sleep during Sunday’s 36-hour HackMIT competition at MIT’s Johnson Athletic Center in Cambridge. CAMBRIDGE — Imagine using the tiny light on a smartphone to draw shapes in the air that are captured in three dimensions by a computer program and can be rotated and viewed from any angle. As recently as Saturday, this program did not exist, but the hours-old technology took first prize Sunday at the Massachusetts Institute of Technology’s first HackMIT, a student-run competition that drew undergraduate and high school programmers from across North America and overseas. The developers of the program, called Lightboard, were Victor Hung, 20, and Vincent Siao, 21, high school friends from Vancouver, British Columbia. Hung and Siao said they set out to record flat drawings, but discovered that it was possible to view the images in three dimensions. “We realized we could capture the depth of the light just based on the size” of the beam as it is recorded by the device, said Hung, a senior computer science major at MIT. Horton the aloe plant (@hortontheplant) tweeted about weather conditions on its Twitter account. Hung and Siao were among more than 1,000 programmers who pulled a massive all-nighter Saturday, greeting the dawn Sunday having created computer programs and electronic tools that could change lives. The long hours were evident inside MIT’s Johnson Athletic Center Sunday morning, where sleeping bodies occupied benches lining a hallway and deflated air mattresses lay heaped in a pile. Other self-described “hackers” — in the sense of creative programmers, not online pirates — wrote code and assembled microcomputers and robotic devices inside the facility’s ice rink, while outside tables were piled high with apples, potato chips, and cookies. At the rink’s center, a young man was cocooned inside a blue-and-gray-striped hoodie, head down on a table for a few moments of sleep. Beside him, a bespectacled fellow in autumnal plaid slumped in his folding chair, arms crossed on his chest, with a dormant laptop computer before him. Ted Meyer (right), 19, who attends Worcester Polytechnic Institute, slept as his team worked on a hack that would allow an image to be parsed into html. While some succumbed to exhaustion, others worked the room, hyped up on caffeine and adrenaline, eager to discuss their work with judges and prospective employers. 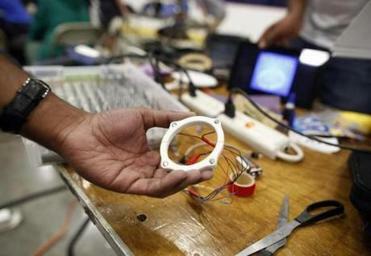 Akash Vaswani, Nabeel Allana, and Mayank Gulati, friends from the University of Waterloo in Waterloo, Ontario, were among 10 finalists for their project, Perceive — a wristband with four tiny embedded rotors that vibrate to indicate left and right, forward and backward. Perceive could be used to guide the blind or those who work in low-visibility situations, such as firefighters, team members said. Vaswani, 21, a mechatronics engineering major from Dubai, said the tactile experience of using the wristband was more intuitive than interacting with a screen. Allana, 20, a mechatronics engineering major from Vancouver, said the device allowed information to come to the user. “The way that we get a lot of information from devices right now is very active, where it can be very passive, like this,” Allana said. Cassandra Morford, 20, a computer science major at the University of Michigan, was among the few women present at the heavily male competition, but she did not mind. “I never have problems making friends or getting help,” Morford said. University of California at San Diego students worked on hacking a mini-fridge by using a camera and sensor to identify food in the fridge and whether it was going bad. Morford said she had attended other hackathons but was competing for the first time on a team with her friend Brian Margosian, also 20 and a University of Michigan student. The pair created stu.dy, an online interface where students would go to view real-time data on the activity in a campus study room. A device built by Margosian includes a microphone to monitor the noise level and a sensor that detects how many Bluetooth-enabled devices are present. Margosian, a computer engineering major, said such a device could save him the trouble of riding his bike a mile to a study room that is noisy and crowded. “It’s designed to solve a real-world problem that students have every day,” he said. Judges from the competition’s corporate sponsors narrowed the hundreds of teams down to 10 finalists, but the three winners were chosen by the vote of their fellow hackers, according to Katie Siegel, a member of the organizing team from the MIT student group TechX. University of Waterloo student Nabeel Allana, 20, held up a bracelet that would allow blind people to navigate more easily. Among the finalists were a program that can build a simple video game around any line drawing, a device that raises and lowers windows in response to weather changes, and an interface that turns the entire planet into a video-game environment using Google Earth. 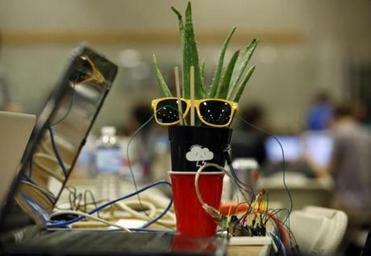 More whimsical projects — such as Horton,an aloe plant that tweets about weather conditions at its Twitter account @hortontheplant — garnered admirers but did not crack the top 10. Some developers expressed hopes of building a business around their creations, but first-place winners Hung and Siao said they were focused on innovation for its own sake. Correction: An earlier version of this story gave the wrong name for the stu.dy online interface.